How to choose an optical imaging system for recording fast brain activity. An important figure of merit for an optical recording system is dynamic range. Dynamic range can be specified in db, in bits, or as an exponent (e.g. 100 db = 17 bits = 105 ). The dynamic range determines the size of smallest fractional intensity change that can be measured. For example, a dynamic range of 100 db would allow one to measure a signal with a fractional change, I/I, of 10-5. The smallest signal that can be measured with a dynamic range of 60 db is 10-3. Quite often, optical signals of biological interest are small (10-2 - 10-4). A large dynamic range ensures that the apparatus can measure small signals with an optimal signal-to-noise ratio. The signal-to-noise ratio is linearly related to the light intensity when dark noise dominates (low light) and linearly related to the square root of the light intensity when shot noise dominates (high light). At low light levels, as in fluorescence or absorption measurements from an intact heart, the performance of a cooled CCD camera (NeuroCCD) is better than the NeuroPDA (photodiode array). But unlike a CCD camera, the diodes won't saturate at high light levels, as in fluorescence or absorption measurements from an intact vertebrate brain, brain slice, or a ganglion. As a result, photodiode systems with parallel amplification generally have a larger dynamic range, thereby yielding a better signal-to-noise ratio at high light levels. While the dynamic range cannot be larger than the effective resolution of the analogue-to-digital converter, it can be considerably smaller if, for example, saturation in the photodetector limits the number of measured photons. Dynamic range can also be reduced by extraneous noise. Base-line subtraction (e.g. by AC coupling) in individual channels improves the effective a-to-d resolution and can increase the dynamic range. � Population signals from intact brains and brain slices -- 12-15 bits. � Multiple individual neurons in invertebrates -- 15-17 bits. � Multiple sites on a single cell -- 12 bits. � Tissue cultured neurons -- 12-17 bits. � Intact hearts -- 10 bits. The dark noise (the noise of the system with no light) affects the signal-to-noise ratio at low light levels. The dark noise is lowest in a cooled CCD. Photodiodes and non­cooled CCDs have a larger dark noise. A frame rate of at least 1 kHz is required for recording action potentials and other fast neuronal or cardiac signals. Good spatial resolution is important for obtaining a high quality image of activity. In general, increasing the number of pixels will increase the spatial resolution. However, in many preparations, light scattering or signals from out-of-focus light are substantial. Thus, a large number of pixels may not actually increase the spatial resolution, but rather will only reduce the amount of photons each pixel receives, thereby reducing the signal-to-noise ratio. The software should be comprehensive and easy to use. - Wu, J-Y. and Cohen, L.B. (1993). Fast multisite optical measurement of membrane potential. In: Fluorescent and Luminescent Probes for Biological Activity, W.T. Mason eds, Academic Press, London. pp 389-404. - Grinvald, A., Frostig, R.D., Lieke E. and Hildesheim, R. (1988). Optical imaging of neuronal activity. Physiological Reviews, 68(4): 1285-1365. The S/N ratio at moderate and high light levels is the square root of the light intensity. To increase the S/N one should pump in (and collect) as much light as possible at the lowest gain (1X). Only at this gain (1X) one uses the full well-size of the CCD and this is the preferred mode of measurement for most bath-stained tissue, such as brain slices and cardiac preparations. The saturation at higher gains (>=3X) is probably amplifier saturation. If saturation occurs at 1X, try to use a higher frame rate (up to 2KHz for the NeuroCCD-SM, 100Hz for the NeuroCCD-SM256, unbinned). This will allow emptying the CCD wells faster, thus avoid saturation w/o losing light. One can temporally bin the data later to increase the S/N ratio. If saturation still occurs when using the highest frame rate, one will have to reduce the illumination. Higher gains should be used at dim light levels to better utilize the 14-bit digitization. Olfactory receptor neuron nerve terminals in the mouse olfactory bulb were stained with Calcium Green-1. Figure A. at top shows odorant elicited signals in in vivo preparations using the two imaging systems; in both cases the signals were the spatial average of the light from one glomerulus. The signal-to-noise ratio for the NeuroCCD-SMQ recording is much larger. This results from a larger number of measured photons in the NeuroCCD-SMQ recording. Similar results were obtained in comparisons made on five mice. Moreover, four trials were averaged in the 2-photon measurement shown in the figure while the result from NeuroCCD was from a single trial. In addition, the numerical aperture (NA) of the lens used for the 2-photon measurement was 0.8 while that used in the ordinary microscope was only 0.5. If a correction for these two factors is applied, the 2-photon measurement would have a signal-to-noise ratio six times smaller than that shown. 1. The incident light in the 2-photon microscope interacts with many fewer dye molecules because only a thin section receives high intensity illumination. 2. Calcium Green-1 has a 2-photon cross section which results in a low optical efficiency. This low efficiency can not be overcome by increasing the incident intensity because higher intensity will heat the preparation. The images formed by the two kinds of microscope are shown in the bottom figure B. (the image made with the ordinary microscope covers a 2x larger area of the bulb). The 2-photon image is the total intensity; the ordinary microscope image is the image of the signal. 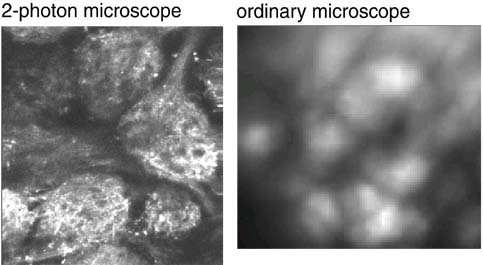 The advantages of 2-photon microscopy are clear; rejection of scattered light and very shallow depth of focus results in much better x-y and z-axis resolution. Clearly the two kinds of imaging systems are optimal for different niches in the parameter space of imaging.